F-Secure researchers recently found malware in the Android Market disguised as free versions of popular games. Disguising malware as a free version of a popular game (such as Cut the Rope and Assassin’s Creed) seems to be a popular tactic that the bad guys are using to scam users of Google’s Android Market app store. Overnight more malware appeared in Google’s official app repository. The Trojanized games have been uploaded by a company calling itself Eldar Limited. 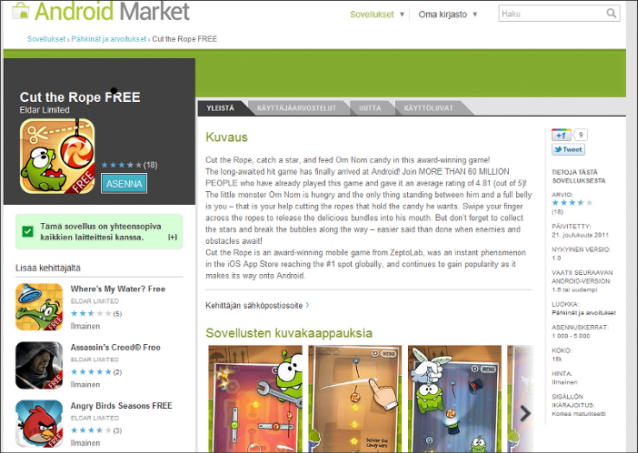 This is the second time in two weeks malware disguised as free games has been uploaded to the Android Market. Google's app police managed to detect this fraud and quickly removed it from the Android Market. While the apps are still listed on AppBrain and AndroidZoom, the links will direct users back to the official Android Market where they have already been removed. "These have now been removed by Google, but their appearance in the official Android Market in the first place is worrying. Not only is Google putting Android users into contact with malware, it is also allowing the brand names of reputable companies to be tarnished by letting the bad guys upload this stuff to the Android Market in the first place." Zdnet posted. A useful tip for users out there is to search for the paid version of the app and take note of the developer’s name. If the name on both paid and free versions matches, then it is very likely to be a safe app. Otherwise, don’t proceed with the download.